As part of my project to play the cello in all of Suffolk’s medieval churches, I am giving fundraising concerts and playing at church fundraising events around the county (and a few just over the border!). I am also available for weddings, funerals and other events. If you would like a fundraising concert at your village church, or cello music for a service or other church event, please contact me. I am also now offering cello lessons to adults; please contact me. Concerts in Newton, Chattisham and Higham (nr Bury) churches are also planned. Dates and details will be posted here as they are confirmed. Saturday 27th April, 6pm. Blythburgh church. Concert with Bristol Chamber Choir. Movements from Bach C major cello suite. Sunday 28th April, 4pm. Kettlebaston church. Concert with Bristol Chamber Choir. Repeat of 27th April. Monday 6th May, 3pm. Cowlinge church. Concert with James Recknell (keyboard). Details TBC. Saturday 11th May, 7pm. Concert in Gazeley church with James Recknell (piano). Music to include Bach, Beethoven, Manuel de Falla, Faure, Elgar, Vaughan Williams and Cassado. Sunday 19th May, 3pm. Concert in Thornham Parva church with Sheida Davis (cello) in memory of Mandy Summers. Bach: cello suite no. 3 in C major; Barriere: Sonata for two cellos; Klengel: Suite for two cellos; Albeniz: Sevilla. Free entry, retiring collection. Refreshments provided. Saturday 25th May, 2.30pm. Concert in St Gregory’s church, Sudbury, with James Recknell (piano). Programme: Bach: Suite no. 1 in G major (on a newly restored late 18th century cello); Schumann: Fantasy pieces; Manuel de Falla: Suite populaire espagnole; Debussy: Sonata in D minor. Free entry, retiring collection. Refreshments provided. Sunday 2nd June (afternoon). Levington church. With Steve Lock (bassoon). Programme to include Bach, Boismortier and Bloch. Free entry, retiring collection. Refreshments provided. Saturday 15th June, 6pm. Concert in St Stephen’s Chapel, Bures. With Sheida Davis (cello). Programme TBC, to include Barriere, Bartok, Klengel and Albeniz. Reserve your tickets (£20 including wine and nibbles) from bevills.events@gmail.com. Please put ‘June 15th concert: [your name], [number of tickets requested (maximum 4)]’ in the subject line. You will receive a confirmation email if seats are available but please take cash to pay at the door. Only 70 seats so it is recommended to apply early. 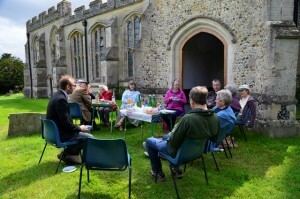 In aid of the Suffolk Historic Churches Trust. With thanks to Geoffrey Probert for the use of his beautiful historic chapel. Saturday 29th June (evening). Concert in Raydon church with Neil Carlson (oboe), Steve Lock (bassoon) and James Recknell (piano). Thursday 4th July, 7.30pm. The Guildhall, Bury St Edmunds. Concert with Kirbye Voices. Saturday 6th July, 7pm. Concert in Hartest church (repeat of 4th July). Tuesday 9th July, 7.30pm Concert in St Mary’s church, Newmarket with James Recknell (piano). Sunday 28th July, 4pm. Concert in Aldringham church with James Recknell (keyboard). Sunday 28th July, 7pm. Concert in South Cove church (TBC). Sunday 4th August (afternoon). Event at Akenham church (details TBC). Saturday 31st August (evening). Concert in Rede church. Saturday 7th September (evening). Concert in Tuddenham (nr Bury) church with James Recknell (keyboard). Saturday 14th September (evening). Concert in Brundish church with Christopher Moore (piano). Sunday 29th September, 3pm. Cello recital in Rushmere St Andrew church with James Recknell (piano). Saturday 2nd November, 3pm. Concert in Great Livermere church with Swyft Singers. Music to include the Monteverdi Mass and Bach cello suite movements. Tuesday 16th April, 12.30pm. Recital in Walsham le Willows church with James Recknell (piano). Programme: Bach Viola da Gamba sonata no. 1 in G major, Beethoven Magic Flute variations, Debussy cello sonata and Martinu Slovak Variations. Refreshments provided, retiring collection. Saturday 30th March, 2pm. Concert in Hepworth church with Kirbye Voices. Cello music including Walton and Bloch. Saturday 2nd March, 7pm. Concert in Covehithe church, with James Recknell (keyboard). Music including Francoeur, Beethoven, Vaughan Williams, Elgar, Bridge and Faure. Saturday 22nd December 7.30pm. St Mary’s Church, Bury St Edmunds. Kirbye Voices, repeat of 20th December. Thursday 20th December 7.30pm. Great Barton Church. Kirbye Voices concert. Sunday 18th November, 5pm. Darsham church. CelloAid concert. Sunday 11th November, 7pm. Monks Eleigh church. Music and readings to celebrate the 100th anniversary of the end of the First World War. Music to include Elgar, Frank Bridge and Vaughan Williams. Saturday 3rd November, 3pm. Brockley church. Concert with James Recknell (keyboard). Music including Francoeur, Beethoven, Elgar, Faure, Vaughan Williams, Frank Bridge and Cassado. Thursday 1st November, 7pm. Barningham church. Music and poetry to celebrate the 100th anniversary of the end of the First World War. Music including Elgar (Salut d’amour, Sospiri), Holst (I vow to thee my country), John Lennon (Imagine) and John Williams (Schindler’s List). Sunday 21st October, 4pm. Lavenham Children’s Literary Festival, Lavenham Village Hall. Creating art to music with children’s author & illustrator, James Mayhew. Accompanist: James Recknell. Music including Tschaikovsky’s Nutcracker Suite and Saint Saens’ Carnival of the Animals. Friday 21st September, 1.10pm. Recital at St Edmundsbury Cathedral with James Recknell (piano). Programme: Francoeur sonata in E major, Debussy Sonata in D minor and Martinu Slovak Variations. Saturday 8th September, 7pm. Wattisfield church, concert with John Wilkin (keyboard). Music by Bach, Mendelssohn, Faure, Elgar and Granados. Saturday 1st September, 7pm. Lackford church, concert with John Wilkin. Music by Bach, Mendelssohn, Faure, Elgar and Granados. Sunday 29th July, 4pm. Aldringham church. Concert with Will Bass (cello) and John Wilkin (keyboard) followed by refreshments and choral evensong at 6pm. Thursday 26th July, 1pm. St Mary’s church, Newmarket. Music by Francoeur, Beethoven, Granados, Faure, Elgar and Cassado. With James Recknell (piano). Saturday 30th June, 2.30pm. Ipswich Unitarian Meeting House. Concert followed by cream tea; music by Francoeur, Beethoven, Granados, Faure, Elgar and Cassado. With James Recknell (piano). Saturday 30th June, 6.30pm. Onehouse church. Cello solos and duets. With Will Bass (cello). Saturday 16th June, 7pm. Concert in Dalham church. Music by Bach, Mendelssohn, Granados, Faure, Elgar and Cassado. With James Recknell (piano). Monday 4th June, 6pm. Get Classical with FJ: interview with Fiona Jessica Wilson of Get Classical, on Ipswich Community Radio, 105.7FM and online at icrfm.com. Saturday 2nd June, 1pm. Hartest church. Solo cello concert. Bach suite no. 2 in D minor and Bach suite no. 3 in C major. Saturday 12th May, 7.30pm. Lavenham Guildhall. Chamber concert with music by Bach, Handel, Vivaldi, Bloch, Shostakovich, Mendelssohn and Granados. Alison Glaister (violin), Stephen Glaister (oboe), Yalda Davis and Will Bass (cello), John Wilkin (keyboard). Sunday 29th April, 4pm. Badley church. 2 Bach cello suites: No. 5 in C minor and No. 3 in C major. Friday 30th March, 2pm. Holy Trinity church, Long Melford. Concert with Kirbye Voices: repeat of 22nd March. Thursday 22nd March, 7.30pm. St John’s church, Bury St Edmunds. Concert with Kirbye Voices: Music for Passiontide. Performance of movements from Bach suites. Thursday 21st December, 7.30pm. St Mary’s church, Bury St Edmunds. Concert with Kirbye Voices. Repeat of 14th December concert. Thursday 14th December, 7.30pm. Great Barton church. Concert with Kirbye Voices. Seasonal music and carols, including O Holy Night and the Dance of the Snowmen on cello. Wednesday 6th December 12.30pm. Woolpit church. Advent service for the Lavenham Deanery. Performance of Handel Trio Sonata for two cellos and keyboard, with Will Bass (cello) and John Wilkin (keyboard). Saturday 2nd December, 12.45pm. St Michael’s church, Framlingham. Cello quartet playing seasonal arrangements (30 mins) at the opening of the Christmas Tree Festival. Saturday 25th November, 7pm. St John’s church, Elmswell. Performance of 3 movements from the Bach cello suite in G major, as part of Variety and Spice: a fun evening of comedy, music and poetry. Friday 8th September. St Peter’s Church, Monks Eleigh. Music including Bach, Beethoven, Fauré, Elgar and Granados. With Stephen Glaister (oboe), Alison Glaister (violin) and John Wilkin (piano). Saturday 2nd September. St Mary’s church, Raydon. Cello duets with Will Bass at the church’s annual fundraising event (running from 10.30am to 3pm). Monday 28th August. Monks Eleigh, private nature reserve. ‘Coffee Morning Plus’. Bach cello suite in G major performed outdoors. Donations split between St Peter’s Church, Monks Eleigh and Pancreatic Cancer Research UK. Saturday 12th August. St Mary’s Church, Bungay. Cello duet concert with Will Bass in aid of the Churches Conservation Trust. Thursday 10th August. 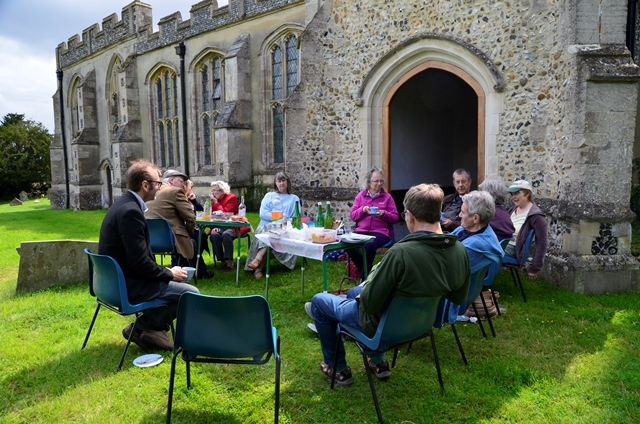 Organised day tour of Stanstead, Glemsford, Boxted and Somerton churches, with picnic lunch in Glemsford churchyard. Cello duets and solos (with Will Bass) played at each church with audiences from each village. Donations made in aid of church funds. Saturday 5th August. St Mary’s Church, Stoke by Nayland. Performance of a Bach cello suite at a private event in the church. Sunday 25th June. St Peter’s Church, Cretingham. Performance of Bach cello suite at Cretingham’s Peace Bell fundraising weekend. Wednesday 14th June. Holy Trinity church, Long Melford. ‘Melford Music’ series, lunchtime cello recital. James Recknell, accompanist. Sunday 21st May. All Saints’ Church, Darsham. ‘Cello Aid’ concert – all cellos, all ages, all levels! – in aid of Suffolk Refugee Support.